Cricket - My Passion: No more gentleman's game! Symond was out for atleast three times but he was not given out even once. He made a not out century (162). Give three lives to Kumble even he can score a century. 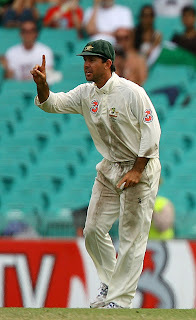 But , why to blame Symonds, because it was Ponting who was leading them from the front. He want to win this match so much that, he downgraded himself and his team to play some cheap cricket. Even Gavaskar can’t resist himself. Let’s see what he has said about Ponting ………. It was not the first time happening with Australia. Remember underarm delivery. They are the most talented team, but I am sorry to say they are the most unsporting and arrongant as well.